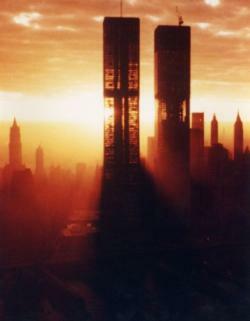 Like most Americans, the events of that day horrified me and still do. I wish I could adequately express my respect for the men and women who died trying to save others’ lives, whether as first responders in Manhattan or passengers aboard Flight 93. This entry was written by filosofo, posted on September 11, 2005 at 9:18 pm, filed under Current Events, New York City and tagged 9/11, World Trade Center. Bookmark the permalink. Follow any comments here with the RSS feed for this post. Post a comment or leave a trackback: Trackback URL. Thanks for the nod. I don’t want to let America forget 9-11, so it’s nice to know that my entry helped you commemmorate the day.